Lately I’ve been working on expanding my culinary repertoire to cuisines other than Italian, and although I’m pretty sure this exact soup isn’t found anywhere near southeast Asia, it’s full of Thai flavors – coconut, lemongrass, red pepper, ginger, and garlic. It’s also pretty easy to make, or tweak, depending on your taste. 1.5 t. Thai red curry paste (I don’t think it’s too spicy, add less if you’re sensitive). Pierce sweet potatoes and bake at 350* until tender. Allow to cool. (If you want to bypass this step, you could peel and dice them and then boil them in the soup liquid, but I think this gives better flavor and texture). In medium-large saucepan, heat oil. Add onion, ginger, and garlic, and saute until onions are tender (about 4 minutes). Add curry paste, broth, and coconut milk. Let this simmer while you peel and dice the cooled baked potatoes. Add sweet potatoes and simmer 15-20 minutes, until creamy. Salt and pepper to taste. 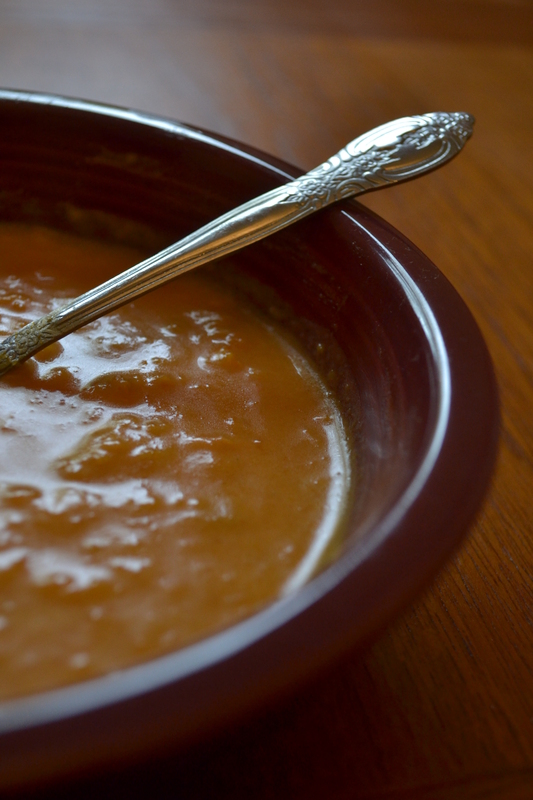 For an even smoother soup, use a potato masher or run the soup through a blender. Finish with lemon juice (just a squeeze or two per bowl). Tags: Daniel Fast, gluten free, recipe, soup, vegan, vegetarian. Bookmark the permalink.